9070 Features: -With back. -Removable back. -Non skid rubber tips and suction tips. -Converts easily for left or right hand transfers. -Weight capacity: 300 lbs. -Bathroom 365 collection. Product Type: -Transfer bench. Weight Capacity: -300 Pounds. Adjustable: -Yes. Corrosion Resistant: -Yes. 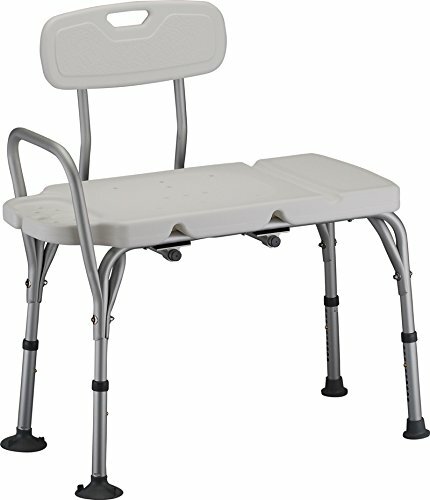 Dimensions: -Seat 31.5'' W x 14.5'' D. -Seat height adjustment: 18.5'' - 23''. Overall Width - Side to Side: -33.5". Overall Depth - Front to Back: -19.5". Overall Product Weight: -11.5 lbs. Overall Height - Top to Bottom: -32.5".